A hate crime is a criminal offense motivated by the offender’s bias against the victim based on the victim’s race, religion, ethnicity, sexual orientation, disability, gender, or national origin. In nearly all cases, hate crimes are violent offenses such as murder, arson, assault, or battery. When an offense is deemed to have been a hate crime, rather than a “normal” violent crime, the charge the alleged offender faces for the offense may be upgraded. For example, a first degree misdemeanor charge may be upgraded to a third degree felony if the alleged offense is determined to have been inspired by the victim’s status in one of the categories listed above. If you are charged with a hate crime or any other criminal offense, start working with an experienced criminal defense lawyer as soon as possible to develop a strong defense strategy for your case. Hate crimes can be charged at any level from first degree misdemeanors to life felonies. As such, the penalties an individual can face for a hate crime conviction vary widely and depend on the facts of his or her case. An individual convicted of a hate crime can face fines, jail time, and probation. Life felonies, the most severe type of criminal charge in Florida, can be punished by death. Insufficient evidence to demonstrate that the offense occurred or that you were the offender. Your defense strategy might also involve demonstrating that your offense was not targeted at a specific individual or group due to race or another factor that would elevate the offense to hate crime status. 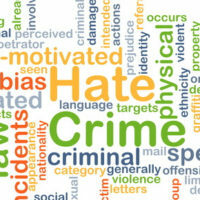 Hate crime is a complicated area of law and sometimes, circumstances of an incident can make it appear to be a hate crime when in reality, it was not. Your personal views are separate from your actions. In the United States, it is not a crime to hate anybody or anything. But it is a crime to allow that hatred to manifest as a violent act against another individual or group. If you are facing a criminal charge, you need to work with an experienced Miami criminal defense lawyer to develop a strong defense strategy for your case. A solid defense strategy can mean the difference between being convicted of your charge and facing its full penalties and having the charge lowered or dismissed. To get started on your case with a member of our team, contact Ratzan & Faccidomo, LLC today to set up your initial consultation in our office.